The tiny town of Ako in south-west Japan is known for the story of 47 Ronin. The city has a beautiful Shinto temple with the statues of those 47 warriors who had chosen to become outlaws to avenge the death of their lord. I had watched the film "47 Ronin" starring Keanu Reaves, which was based on this story. Recently I was in Okayama, which is not very far from Ako. Thus, it was an opportunity to go and visit this city and to become familiar with its famous legend. The Samurai (Bushi) warriors became an important group in Japan in the 12th century when they worked for feudal lords. Those lords along with their samurai were the real rulers of Japan. The samurai followed a code of conduct called Bushido. According to the Bushido, when a Samurai became master-less, for example by the death of his master, he was expected lay down his arms and to commit suicide by Seppaku (by plunging a knife in the stomach). Any samurai who did not kill himself was known as ronin, a warrior without honour. The ronin were looked down upon by their fellow samurai and by the society. They were ridiculed and faced public humiliation. In 1868, with the Meiji reforms, the military control of country was replaced by a centralised bureaucratic governance. This ended the role of samurai. "Ako vendetta", was a historical event in which a group of ronin avenged the death of their master Lord Naganori Asano. In 1701, Lord Asano, the Daimyo of Ako, was forced to commit ritual suicide by Kira Yoshinaka, a scheming official of the imperial court. However Asano's samurai did not commit seppaku as foreseen by the Bushido and instead became ronin. Their initial attempts to avenge the death of Lord Asano were unsuccessful. However, finally 47 ronin managed to kill Kira at Sangakuji in Edo (now known as Tokyo). Even though by taking up the arms they had violated the samurai code of conduct, their honorable action in avenging Lord Asano was recognized. Thus the 47 ronin were allowed an honourable death by committing seppuku. During the Meijo era (1868-1912), the story of 47 ronin became very popular all over Japan through songs and traditional plays such as kabuki. It was a tale of persistence, honour and sacrifice. The Hollywood film "47 Ronin" (2013) was inspired from this story. Ako is located in the Hyogo prefacture in south-west Japan, between Osaka and Okayama. Its railway station is called Banshu-Ako. It is a small coastal town facing the inland sea. It has a population of around 50,000. Ako is located on the banks of Chikusa river and has a good network of canals. On 14 December each year, Ako celebrates the Gishisai festival to remember the 47 ronin, with a parade of the warriors dressed in old costumes and illuminations with lanterns. To reach Banshu-Ako I took the Ako line local train from Okayama. The journey took around an hour. Passing through small towns and villages (including Bizen and Osafune, two famous small towns) along with verdant mountains, it was a beautiful journey. The local train network also connects Ako to Himeji and Kobe. When I told my Japanese friends that I wanted to visit Ako, they were a little surprised. The city's name was not so familiar to them. Even at the tourist office in Okayama, they were surprised that I wanted to go to Ako. They were not sure if there was much to see in Ako. However, as you can see, it is a beautiful city and is worth visiting. The city centre is small. The places to visit include the ruins of the castle of Ako and some shrines and temples. Among the shrines, the most important is the Shinto shrine linked with the 47 ronin located near the castle. Among the temples, the most important is Kagaku temple. All these places are less than one km from the railway station. The city including the railway station, is full of banners, posters and tiles with images of the different ronin warriors. Near the ruins of the Ako castle is the Shinto shrine dedicated to the 47 ronin. It is called Oisho shrine to remember Oisho, the leader of those ronin. To reach it, just take the central road in front of the railway station and go straight. Outside the station, there is a map where you can see the location of the different shrines and the castle. I went through the gate in the outer wall of Ako castle. There was no ticket to enter it. A winding path passing near the Ako Museum of History and the gardens of Ako castle took me to the shrine, marked by a double row of statues of the 47 ronin. Each statue of the ronin was different - showing men of different age groups, each with his favourite weapon, some of them standing while others were sitting. Against the background of the castle ruins, the two rows of statues lining the path leading to the shrine made a powerful visual impact. 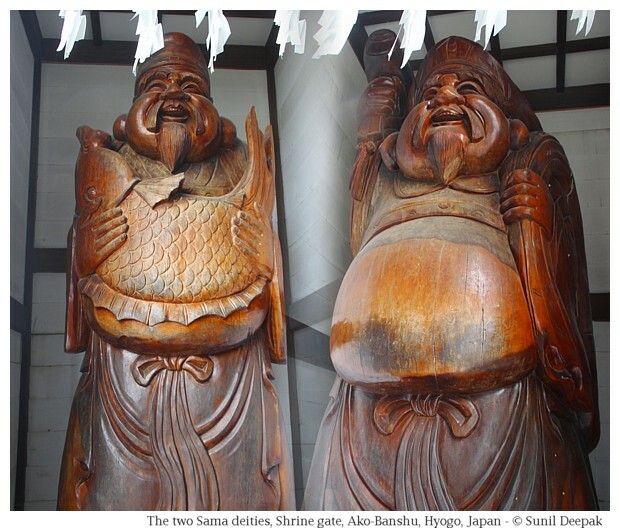 Inside the shrine gate (Torii), on the two sides were two giant wooden statues of pot-bellied old men. The one on the left had Daikoku Sama symbolising luck and matrimonial happiness. The one on the right had Ebisu Sama symbolising success in business and trade. There were different memorials for persons to express their admiration for the warriors - for example, through the streamers of paper-cranes usually placed in cemeteries. The courtyard also has a statue of Oishi Kuranosuke, the leader of the ronin. One of the buildings was Homotsu-Kan or the treasure hall, entry to which has a ticket. Inside you can see the Oishi "Glass of Rules" for the Ako samurai. The rules included the following - do not fight, do not spill drink from your mouth and do not force a non-drinker to drink. A path from the Shinto shrine led to a beautiful garden just outside the castle ruins. When I visited it in April 2017, it was not yet completely done and some parts were closed. Still it seemed to be landscaped beautifully with a canal, some gently bubbling fountains and a quaint bridge. I think that this part of the castle and the gardens are being renovated to become future tourist attractions. Imposing walls surrounded the castle ruins. This castle was destroyed by the bombings during the second World War, The walls have been recently rebuilt to recreate the old ambiance. Inside the walls, most of the ruins are just empty spaces marked on the floor explaining the different building of the old castle. The castle was built by Naganao Asano Ako, the third lord of Ako domain and the grandfather of Naganori Asano. It took them 13 years to built this castle. I was told that the rooms of the Lord and his wife were marked on the floor, but since it was only in Japanese, I could not identify them. On one side inside the castle, there is a tower (Tenshudai), where you can go up and have a panoramic view of the area. The ruins also include two ponds, both beautifully designed to evoke feelings of peace and harmony. The Kagakuji or Sengakuji was the family temple of the Asano family. When I visited it, a group of art students was there sketching it. It is a beautiful Buddhist temple with a giant bell and with different shrines. I was told that Kagaku temple has the tombs of the 47 ronin, each marked by the number "7" to denote death by seppuku. However, I had also read that the tombs of the 47 ronin are in the cemetery of the Sengakuji temple in Tokyo, so I am not sure if the tombs in the Kagaku temple of Ako were real or not. I did not see them. I could visit Ako only for a few hours. It was a rainy day. I knew that there would not be enough time to visit the historical museum or to go to the seaside. On the other hand, I had thought that I will be able to visit Chikusa river and a couple of other shrines near the railway station. However, the visit to the castle and the Oishi took most of my time and I could not do more. I think that Ako merits a visit. If you are visiting south-west Japan, it would be worthwhile keeping a morning to visit it. Note: I would like to acknowledge an article by Takako Shimatani for discovering information about Ako. It was not easy to find other information in English.